Bunte is a prestigious German magazine which covers the latest information about celebrities, gossips and lifestyles of the top notch class. Buy a single copy or subscription to Bunte magazine. The first issue of this esteemed magazine came in 1954. The magazine comes with its issue on a weekly basis. It carries with it sophistication in its content. This is the Germany's ubiquitous magazine, with its weekly circulation crossing a mark of almost 7.5 lacs copies. The latest of the gossips and news about the celebrities is portrayed in this magazine in a certain fanciful manner. The readers get a chance to intrude into the life of their favorite celebs through this amazing magazine. The news pieces are not based on certain hearsay or rumors; instead the individuals working behind the pages of this magazine work day and night to get the facts right, and bring the truest of the stories for its readers. Bunte Magazine also boasts a number of interviews of the celebrities from every category. The movie stars, musicians, singers and other celebrities are amongst the eminent person who regularly gives interviews and share about their life. Their lifestyle offers a source of inspiration for the readers, who perceive these individuals as their role models. The candid interviews are one of the most sought after section in the magazine. The magazine aims for the section of readers who always desire of being updated about the latest trends and gossips. The class of people, who want to get each and every detail about the lifestyles of their favorite celebrities, particularly read this magazine. Many of the renowned celebrities have glorified the cover of this magazine with their stylish presence. 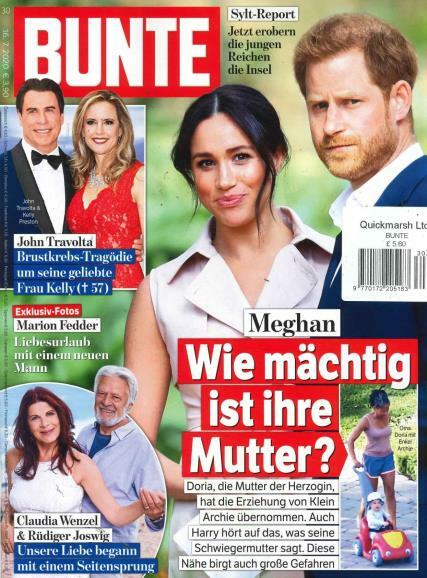 The celebrities such as Hugh Grant, Tom Cruise, Nicole Kidman, Bruce Wills, Michael Jackson and Elizabeth Hurley amongst others have appeared on the cover of Bunte Magazine.